‘Stagecraft’ refers to a number of aspects of performing and preparation for a performance from seemingly simple things such as appropriate dress and deportment to managing anxiety, programme planning and notes, communication (both verbal and musical), energy and emotional intensity, and movement and gestures. Stagecraft is not just the ability to walk onto the stage without tripping over. From the moment the performer enters the stage, his or her communication with the audience begins, and the way one greets and acknowledges the audience can have an important effect on the way the audience receives and enjoys the performance which follows. An understanding and appreciation of good stagecraft is very important and can help one produce a good performance, regardless of the level at which one plays. Stagecraft is an important factor in music diplomas and candidates are marked on their stage deportment, communication, programme notes and attire. Good stagecraft can also increase one’s feelings of confidence in a performance situation. Get into the habit of building good stagecraft into your practising and preparations and you will find you can pull off a poised and engaging performance. This ties in with managing anxiety. If you are well-prepared and know your pieces you are far more likely to pull off a polished performance while also keeping nerves at bay. Play within your capabilities and make sure all tricky passages have been thoroughly ironed out. This is an important aspect for people who taking are performance diplomas where one is judged on the ability to produce an interesting and varied programme. Think about the music from the listener’s point of view, rather than simply playing pieces you think the examiner wants to hear. Good programmes are like stories, with a beginning (perhaps a Prelude or short albumleaf), middle and an end, and the ability to vary degrees of energy in a programme will prevent it becoming too ‘samey’ or dull. Interesting and surprising juxtapositions – for example, a Baroque piece paired with something contemporary – can be very exciting and can help throw a new light on familiar repertoire. The late Phyllis Sellick apparently used to describe a programme by all one composer as ‘a list’, but single composer programmes can work really well if the performer has thought about differing levels of energy and emotional content in the pieces selected. Choosing the correct attire for the time of day and venue is important. Full evening dress is not appropriate for a lunchtime or afternoon concert, and the style and atmosphere of the venue is also a factor in deciding what to wear. The performer’s concert attire is a means of differentiating you from the audience and defines your role for them. Getting ‘dressed up’ for a concert allows you to appreciate that this is an ‘occasion’, distinct from the practising and work done at home at the piano. The most important aspect is that you feel comfortable in your concert clothes, with plenty of freedom of movement and no distractions such as tickly labels or zips. No matter how anxious you feel, your stage deportment should not betray your nerves. Walk confidently across the stage, greet the audience or bow, and sit at the piano. Take a moment to compose yourself before you play: this ‘breathing space’ at the start of a concert is vital, not just for you as the performer, but also for the audience, making them sensitive to the music about the wash over them. 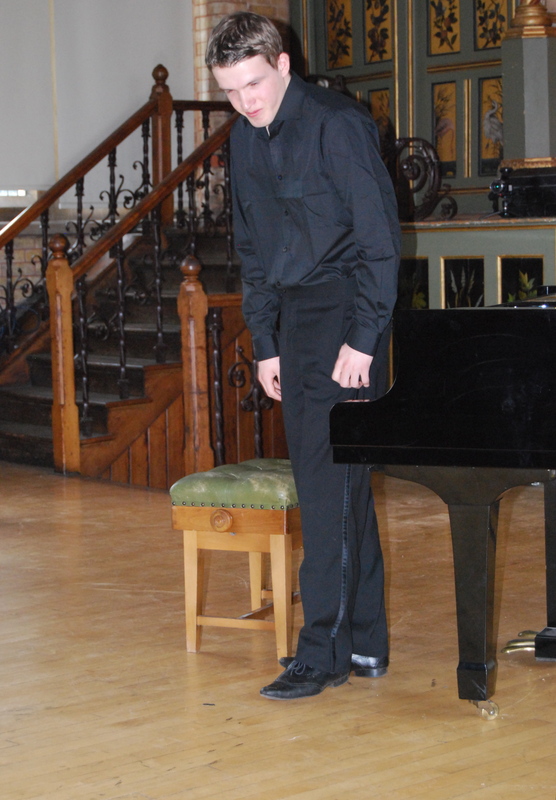 Likewise at the end of the piece, don’t hurry away from the piano, nor scurry off the stage immediately. Take time to acknowledge the audience. This is becoming more and more popular at professional concerts I attend, and a few words about the music being performed can immediately make the audience feel more engaged and connected to the performer. Talk clearly and don’t simply repeat the programme notes. Most people are interested in why the performer has chosen the repertoire and what makes it special for them. Never pre-empt your performance by telling the audience you played the piece well in practise at home, or that you are very nervous! To play from memory or not? The debate about whether playing from memory results in a better performance rages on, but if you do use a score, try not to cling to it as if you life depends on it. In particular, make sure tricky sections and page turns are memorised. Have someone turn for you, as this can increase the professionalism of your performance. Enjoy the compliments from the audience and never apologise for errors or slips in your performance. Save these things for when you next go to practise, for all these issues are useful and help prepare for the next performance. Above all, learn to enjoy performing. It is a wonderful cultural gift to be able to share so much fantastic piano music!